UPDATE: Tickets are almost gone! We sold out of the initial batch, and have released a few more - these might be it! Don't miss out! First off, HUGE thanks to everyone who came out for last month's HMAD screening of Friday the 13th Part VII! It was one of the biggest turnouts I've ever had for one of my shows, which made me (and the theater!) very happy. And a special thanks to editor Barry Zetlin who came out to talk about the film's infamous battles with the MPAA ("The NO Blood" should be the subtitle). The print was also better than expected, and a guy dressed in pretty terrific Jason costume (same design as the film) took pics with the crowd after, so all in all it was a pretty great time. And I suspect this month's show will be even better! Just like Friday 7, Renny Harlin's Nightmare On Elm St Part 4: The Dream Master is celebrating its 25th birthday this month, almost to the very day of the showing! On Saturday, August 17th at 11:59pm, I'll be hosting a very rare 35mm screening of the film, which remains (and probably always WILL remain) the biggest ticket seller of Freddy's solo adventures (his fight with Jason scared up a few more), scaring up nearly 50 million in 1988, good enough to rank #19 for the year ahead of star vehicles like Tequila Sunrise and even the final Dirty Harry movie. 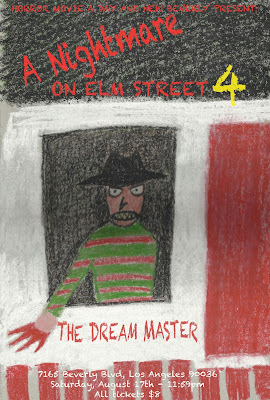 That was the peak of Freddy's popularity, in fact - the merchandising machine was going full steam, he was coming off the 3rd (and still best) film Dream Warriors, the TV show was about to hit the air... good times. Also, on a personal level, I'm stoked to see it on the big screen, as I remember BEGGING my mother to take me to see it on that weekend in August, only to be turned down (though she rented it for me when it hit VHS that holiday season). After 25 years, I will finally have my revenge! TAKE THAT, MA! Of course, as an 8 year old I never dreamed I'd be hosting my own shows someday, and I certainly wouldn't have though I'd get to sit up there and chat with some of the film's stars beforehand - but that's precisely what I'm doing! Actors Andras Jones (Rick), Toy Newkirk (Sheila), Rodney Eastman (Joey), Brooke Theiss (Debbie), Tuesday Knight (Kristen), and Lisa Wilcox (Alice) will be on hand for pre-movie Q&A (schedules permitting), which is nearly the ENTIRE cast of Elm Street kids from this entry! That is amazing!!!! Needless to say, it's going to be A. an awesome time and B. more than likely just as packed, if not more so, than it was for Friday 7, so get there on time for a good seat! I probably won't have any crappy DVDs to giveaway (save your tears) so we can spend more time talking to our honored guests Scream Factory has donated a few Blu-rays to give out, including Prison, the film that got Harlin the gig directing Nightmare 4! - so don't be late! As always, the screening will be at the New Beverly Cinema at 7165 Beverly Blvd in Los Angeles, 90036 (two blocks west of La Brea). Street parking is plentiful, with Formosa being the best bet. Tickets are 8 bucks cash or card at the door, or in advance at BrownPaperTickets. I know it's usually not necessary, but they just went on sale today and 1/5th of them are gone, so I suspect this screening WILL sell out - keep an eye out here as I'll be updating with the count to let you know if you are about to miss out! And check out the poster, inspired by the film's creepy opening sequence! It once again comes courtesy of the awesome Jacopo Tenani, who designs these posters and thus spares you all from my horrible Photoshop jobs. You can see more of his great art (including a really cool Suspiria piece) at his site HERE, and I highly urge you to do so! Send him some love if you can, and see you at the theater on August 17th! This poster is nice, but I rather enjoy your crappy photoshop jobs.